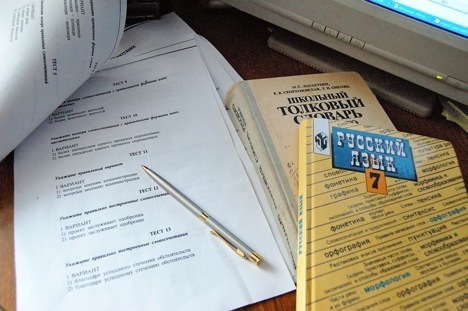 The bill suggests a ban on the use in the workplace of any language other than Russian, or those officially recognized as minority languages in Russia. Two Russian MPs made laughing stocks of themselves when they submitted a bill on the protection of the Russian language littered with dozens of grammatical errors. The gaffe prompted their party leader to blast the parliamentarians. The bill submitted by Liberal Democrats Elena Afanasyeva and Yan Zellinsky suggests a ban on the use in the workplace of any language other than Russian, or those officially recognized as minority languages in Russia. The set of documents they authored, including the bill itself, a written argument in its favor and some auxiliary papers, is only seven pages long, with most of them leaving large blank areas. Yet the MPs (or an assistant of theirs) managed to miss more than a dozen of grammar errors in the text. The mistakes included non-agreement of genders, incorrect verb conjugations and other forms of grammatical inflection, punctuation errors, apparent typos and other flaws of form, which children are usually taught to avoid in school. Pages from the bill marked in red pen, but mercifully lacking a deserved ‘F’ at the bottom, were quick to spread all over Russian blogs. Critics were also ruthless in describing the substance of the bill as well. They said the proposition is discriminatory and would be near impossible to enforce. The authors were accused of cheap populism and exploitation of the hot issue of migrant workers in Russia, who are widely seen as often lacking proper knowledge of the Russian language and are thus difficult to communicate with for Russians. Amid the online ridicule, head of the Liberal Democratic Party Vladimir Zhirinovsky tried to distance himself and his parliamentary party from the unfortunate bill. “It’s their personal, individual initiative. But if there are errors in it, we will point them out to them. Let them show their lack of literacy at home,” the flamboyant politician said. He also criticized the idea of banning the use of particular languages in Russia. A red-faced Zelinsky explained the gaffe, saying he mistakenly submitted a draft of the bill rather than the proof-read later version. “I wrote it when my head was full of ideas. When the thoughts flow, I write very fast so as not to let them escape. Then I correct all errors. It so happened that I printed the first version of the document and put it on the table,” he said. How difficult is the Russian language? His co-author put the blame on an assistant, who apparently printed the document after receiving it in electronic form. “The assistant printed it and read to us aloud. We were busy with the pension reform at the time, so we signed it without re-checking first. It’s our man’s mistake - we admit it,” she explained, adding that some disciplinary action may be taken against the assistant. The party produced some other eyebrow-raising bills recently, including one banning the circulation of the US dollar in Russia to protect the national economy from an eventual downfall of the American currency. Another one aimed to regulate consumption of garlic due to the bad smell it causes. And in February the party tabled another proposition on how the Russian language should be protected. They suggested banning the use of Russian words of foreign origin introduced after the late 1980s, on penalty of fines. The initiative received insufficient support in the legislature.